Contraception and women’s health are issues that often garner national attention, and may again with the Pope Francis’ historic visit to the U.S this week Presidential elections also draw attention to women’s health ­­­–– in the 2012 presidential race, the issue of mandated coverage for birth control through the Affordable Care Act (ACA), often referred to as Obamacare, became the subject of a Supreme Court case. GOP candidates in the current bid for their party’s nomination have similarly made contraception a central issue, and Congress is considering shutting down the government in an effort to defund Planned Parenthood after the emergence of many hidden camera videos which record the organization’s officials discussing the donation of fetal tissue. Fetal tissue research and the reimbursement of expenses related to handling and transportation of the materials is legal (read this FactCheck article on why) and largely supported by the medical and academic communities, as well as past political leaders. The videos became the impetus to resurrect debates regarding women’s health and religion versus science from both sides of the aisle. Given the importance of access to contraception, women’s health, and the significant political attention it is receiving during the Pope’s visit and the current presidential race, let’s take a deeper dive to explore what the evidence tells us about contraception. In this blog, we will focus primarily on hormonal contraception, the most commonly used form of contraception, in America (including emergency contraception, although some, particularly those of certain faiths, consider this a form of abortion because they believe life begins at conception. However, the Association of Reproductive Health Professionals distinguishes emergency contraception from a medical abortion). What is hormonal contraception and how does it work? Hormonal contraception is typically a mixture of synthetic estrogen and progestin­­ ­­–– although some hormonal contraceptives use only progestin –– and can come in the form of a pill, an injection, a skin patch, an insertable ring, or T-shaped intrauterine device (IUD). It works by preventing ovulation, stopping the sperm from fertilizing an egg, or preventing the egg from implanting in the uterus. While hormonal birth control methods are among some of the most effective forms of contraception if used properly, their effectiveness varies greatly depending on the method of hormone delivery and patient usage. For example, a contraceptive pill has a 3 percent failure rate after 10 years when used perfectly (which is not usual) but a 61 percent failure rate after 10 years of typical use, whereas an IUD remains at a 2 percent failure rate over 10 years because once implanted, it doesn’t require as much user maintenance. Nearly 45 percent of all women using contraception use hormonal contraception with the pill being the most popular type of contraception overall. Let’s review some common questions and concerns about contraception, and what the evidence so far suggests. 1. Use of hormonal contraception promotes teenage sexual activity, leading to more pregnancies and live births in the United States. 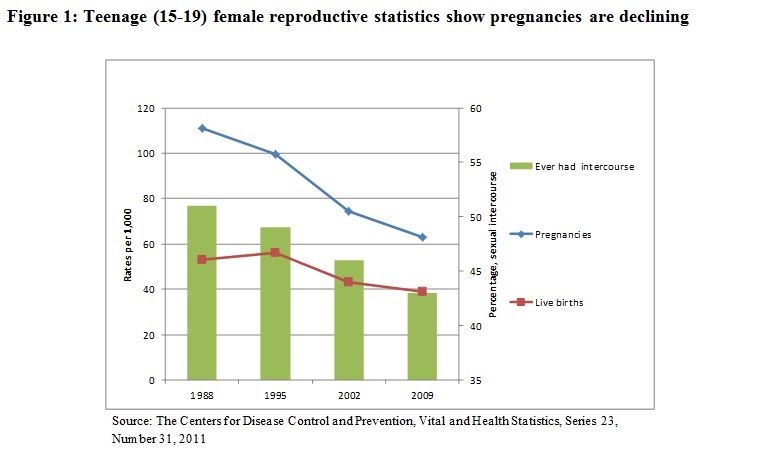 What we know: The CDC shows the trend is the inverse, as shown in Figure 1. Sexual activity among teenagers, as well as birth and pregnancy rates, have declined regardless of hormonal contraception use (we note patch usage among teenagers has declined, while emergency contraception use has significantly increased, and pill usage has stayed relatively the same). There are likely other factors as well; for instance our colleagues suggest that exposure to the MTV show 16 and Pregnant influences teens’ thinking regarding birth control and abortion. 2. With hormonal contraception now more widely available, the rate of sexually transmitted infections (STIs) is increasing. What we know: Few studies exist that attempt to establish a relationship between the increased use of hormonal contraception and STIs. One American study and one English study have found emergency contraception is associated with increased STI rates. No evidence exists on other forms of hormonal birth control and their association with STIs. CDC data generally shows decreasing or stable rates of most STIs nationally, although other factors, such as the HPV vaccine, may be associated with this. 3. Emergency contraception leads to fewer birth and medical abortions. What we know: There is limited evidence regarding the linkages between emergency contraception and births or abortions. Two studies found that increased access through over-the-counter laws found no decreases in either birth or abortion rates. Another Utah-based study, however, found that between 2000 and 2006 both birth and medical abortion rates decreased significantly while emergency contraception use increased. Currently, the Association of Reproductive Health Professionals states no study has shown a reduction in pregnancy or abortion rates with increased access to emergency contraception. 4. Many women use birth control for reasons other than preventing pregnancy. What we know: In a national survey, 14 percent of women said they took the pill exclusively for non-contraceptive benefits, such as PMS relief, less painful periods, and clearer skin. Among 15-19 year olds, the rate was even higher at 33 percent. A new study shows significant reductions in the risk for endometrial cancer with proper pill usage. 5. Women who identify as religious tend not to use birth control. What we know: The Guttermacher Institute (a non-profit reproductive rights advocacy group that supports abortion) found 89 percent of Catholic women and 90 percent of Protestant women at-risk for pregnancy used some form of contraception; the same survey found that that the majority of women have a religious affiliation, attend services at least once a month and say it is very important to their daily lives. 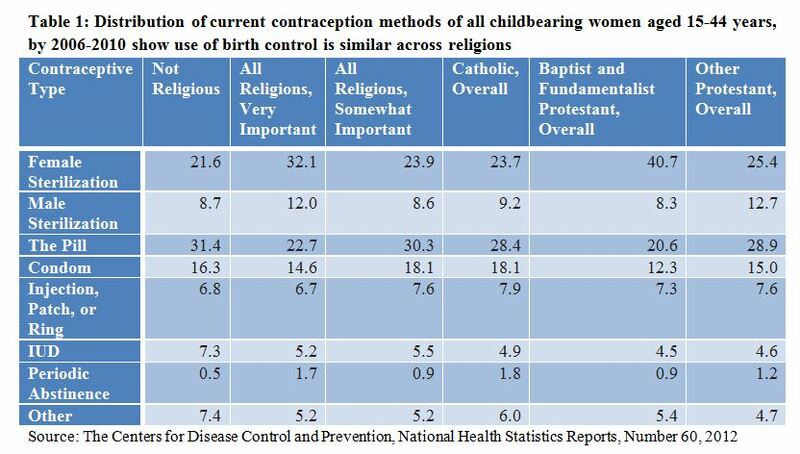 Among sexually active women, regardless of religious affiliation, the use of birth control, including the pill and IUD, is very similar to those who do not identify as religious, as shown by table 1. Although sexually experienced Catholic women tend to practice periods of abstinence more and have lower use of all other methods, the difference is small. Among all child-bearing women and men (15-44 years) who use contraception and identified religion as “very important” and “attended services once or more a week,” female sterilization was the most popular from of contraception (around 30 percent) followed by the pill (around 20 percent). 6. Now that we have the ACA, all insured women have free or nearly free access to all birth control methods. What we know: The ACA requires that all plans offered on health insurance exchanges cover all Food and Drug Administration-approved birth-control methods when provided by in-network providers, at no cost to the beneficiary. However, individuals remaining on grandfathered plans are not subject to ACA requirements and they may be required to share costs for their contraceptive services. Further, insurers offering plans on the exchange previously had greater leniency to apply “reasonable medical management techniques” to control costs. However, one study of health plans in five states found that this effectively resulted in high costs or denied coverage of many costly yet effective means of contraception. To ameliorate the situation, the Department of Labor issued a new May 2015 FAQ clarifying that insurers cover at least one form of each of the 18 FDA-approved methods.